We love living and working here in the Axarquia region of the Eastern Costa del Sol and would like to share with you our detailed local knowledge of the delightful undiscovered region of Andalucia between Malaga and Nerja. If you thought that southern Spain’s Costa del Sol was just about the high-rise concrete jungle that is Torremolinos or the over-priced glitz of Marbella, then think again. Places such as Nerja, Torrox, Torre Del Mar and Velez-Malaga may not be familiar to most, but then it could be said that it is this anonymity that makes the Axarquia region one of the most attractive, if unexplored, parts of Andalucia. Less cosmopolitan, and still retaining its proud Spanish way of life, the Axarquia region offers those who choose to visit, the perfect mix of sleepy white washed Andalucian villages, unspoilt beaches & beautiful countryside. Including some spectacular walking & cycling trails to cater to the pursuits of all abilities. For those who prefer to explore in a more leisurely and perhaps a less strenuous fashion, the region has a number of themed driving routes or ‘rutas’ to follow. Such as Ruta del Sol y del Vino (sun & wine route) & Ruta del Aceite y los Montes (olive oil & mountains route). After a day of taking in the varied sights that the Axarquia region has to offer there are plenty of opportunities to relax at one of the area’s many beaches, and maybe take some refreshments at one of the numerous beachside ‘chringuitos’ (beach restaurant), which serve local speciality fish & meat dishes as well as that well earned cold drink. When a more lively atmosphere is called for then you could do no better that spending a day visiting the much overlooked but ever improving city of Malaga. In recent times the historical old quarter of the city around the cathedral has been upgraded & pedestrianised. The city can now even boast of having it’s own underground Metro system which makes a visit to the city’s many museums and attractions even easier. So that is our brief guide to why you should consider a visit to the Axarquia region of the Eastern Costa del Sol. For more detailed information please take some time to read through our destination guides, which contain lots of useful information about the places to visit and things to do when you are planning your next visit to Southern Spain. We highly recommend that you consider a different approach. Instead of following the convoy of tour buses out of the airport, try turning left (East) and come to the Axarquia region for a truly Spanish Costa del Sol experience. If you can see this, your browser doesn't	understand iframe. Regular news updates and features on developments in the Axarquia region of the Costa del Sol. Do you own a rental property in the Axarquia that you only use part of the year? Freewayspain.com property management and letting services can help you with all your requirements. Travel guide to holiday destinations in the alternative Costa del Sol. Comprehensive travel guide gives you all the the information you need to decide where to stay in eastern Andalucia's beautiful Axarquia region in southern Spain. Travel guide to Nerja in the alternative Costa del Sol. A comprehensive travel guide to the town and beach resort of Nerja in the Axarquia region of Andalucia, southern Spain. A comprehensive travel guide to the beach resort of Torre del Mar in the Axarquia region of Andalucia, southern Spain. Sightseeing in the Axarquia region of Andalucia, southern Spain - an opportunity to explore the fascinating stories from the past that shape todays Spanish culture. Guide to activities and sports in the alternative Costa del Sol. Information on activities & sports including golf, fishing, diving and walking along with ideas for fun family days out in Andalucia, southern Spain. Guide to the beaches of the alternative Costa del Sol, Spain. Find out where the best beaches in the beautiful Axarquia region of southern Spain are and what they have to offer. Guide to culture in the alternative Costa del Sol. Sightseeing, flamenco, fiestas, theatre - find out about the culture of the Axarquia and make the most of your holiday in Andalucia, southern Spain. Guide to the Fiestas of the alternative Costa del Sol. A comprehensive guide to the Fiestas and feast day celebrations in the Axarquia region of Andalucia, southern Spain. Guide to food and drink in the alternative Costa del Sol. Car hire, public transport, taxi ranks - all you need to know about getting around the Axarquia region of Andalucia, southern Spain. Information on booking flights to Malaga Airport for the Costa del Sol. How to find the best value flights to Malaga Airport for the Costa del Sol including info on UK airport parking and hotels, transport options to UK airports, and travel insurance. Street markets, malls and downtown shops are all covered in this essential guide to shopping for visitors to Andalucia's Axarquia region in southern Spain. Le damos la bienvenida a la región de la Axarquía en la Costa del Sol. Somos una empresa nueva de servicios de alquiler y administracion de propiedades de la region andaluza de la Axarquia. 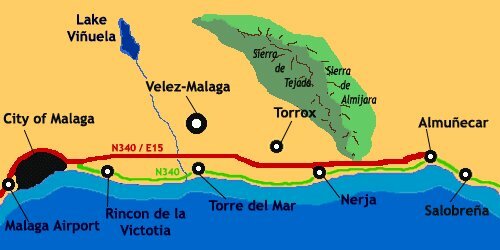 Si está buscando alojamiento para sus vacaciones en la Axarquía, Andalucía, freewayspain.com tiene la solución para usted. Links to related travel services. Links to useful travel services for travellers to Malaga airport, Spain. 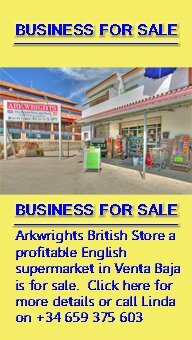 Add your local business or Spanish themed web site to our web site directory. Would you like to share your knowledge about axarquia? Great, find out how you can submit your story or tip here.